Thanks for visiting my website. My name is Mighty Rasing. (I know my name sounds weird, so if you meet me sometime soon, ask me about that.) I am a youth worker who currently serves as the Director of Program Development for the Central Conferences of Young People’s Ministries, the global youth ministry agency of the United Methodist Church. 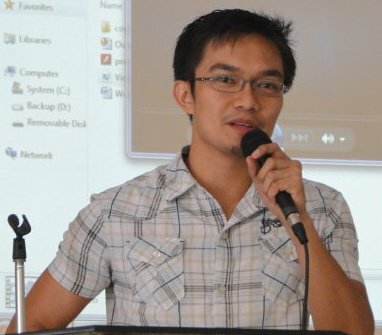 I served as the National President of the United Methodist Youth Fellowship in the Philippines from June 2006 – May 2008. To make this ministry possible, I did a crazy thing and resigned from a budding career, with a good salary level I should add, in the Business Process Outsourcing industry in the Philippines. My ministry was a volunteer position with no salary. But God provided for my needs, and I learned so many things about freelancing, and sustaining myself while doing ministry. I joined Young People’s Ministries as its Philippine Staff in March 2009 and served in that capacity until the end of March 2015. Together with my family, I have since relocated to Nashville, TN USA for my new role. I work with youth and young adult leaders all over the world in the areas of faith formation, leadership development, and advocacy. I have written three books. This is my personal website where I post resources related to books I’ve written and any project I may be working on. Views and opinions posted here are my own and does not reflect that of Young People’s Ministries. I need people like you who is interested in leadership development. I conduct leadership seminars mainly based on transformational leadership, servant leadership, and spiritual leaders. It is the first though where I get the most invitations. As of now, there is an invitation for me to conduct a seminar on transformational leadership for school principals. Maybe we can help each other create a better program for Filipinos on the subject of transformational leadership. I hope also that you will grace my website with new articles that will inspire people to help in the transformation of our society. Two weeks ago, I finished my two-day Speak with Confidence workshop for the Pastors of United Methodist Church. We conducted the workshop in Kalaw, Manila. It is really a small world. Hi Jef, it’s a small world indeed! glad to know you helped some of our pastors develop the skills to speak confidently! 🙂 We really need to inspire more people to help contribute toward social change. I’m with you on that purpose. Hi Mighty, thanks so much for dropping by in my site! It is indeed an honor to know like-minded people! I am sure to be following your articles from now on! Hey if you have speaking engagement schedules let me know, maybe I can come and watch you and learn! Thanks man! Godbless! Hello Mighty. Nice site you have here. Am also passionate about leadership and personal development. Well Mighty you are a very suprising find, I’m in my mid 50’s now, and have been in management for most of my life, lol you could say i’m one of your concepts fore founders! A 100% on all fronts my young friend, except i wish you had left the religious context out it, although i do being in a greater power, i doubt very much that any earthly religion has much validity or benifit to give to the world. It also dilutes the truths in what you are teaching. lol sorry mate, everyone is a critic, i am very pleased to see some youth today are progressive, the West it seems, has lost its fight in cultural growth! Hi Mighty. I would like to know how you got into my fb address. Definitely interested in your advocacy. Incidentally, I was NUMYF president in 1968-70. Hi Mighty, I read your book on goodreads grabeh laking tulong sakin yong advice mo for blogger na nag-start palang. I also love your articles and advocacy for youth, leadership and personal development. Sana someday makamit ko rin pangarap ko maging kagaya mo. Continue the genuine service for others po, laking bagay para sa aming nag uumpisa palang ang mga advice and tips nyo po. More blessings, more power and Godbless.